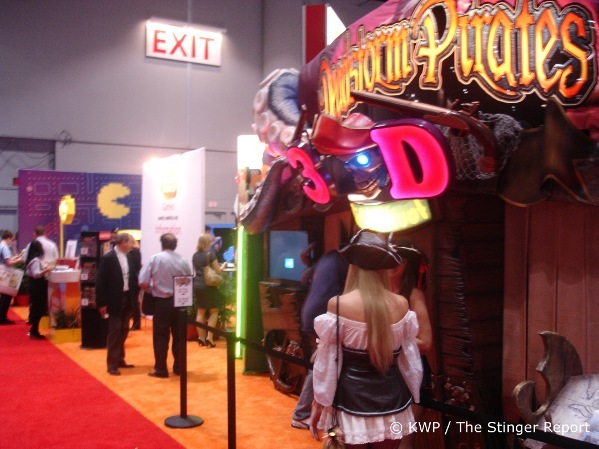 As they like to say in movie trailers, “The wait is over” as the latest IAAPA Expo is upon us. 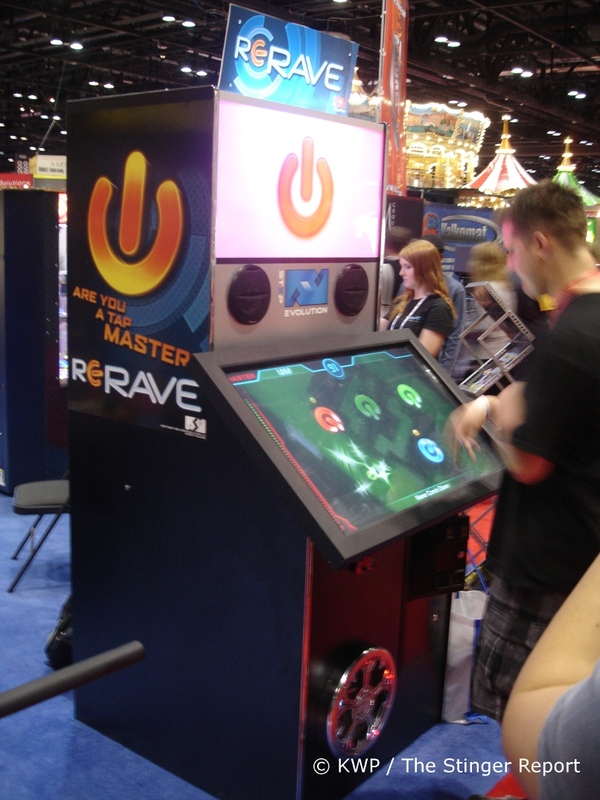 Taking place this week in Orlando, FL, as it will be for the next decade, we are there to get some hands-on time with the latest products that will be gracing arcades and other entertainment venues over the next year or so. As always, click on the link below to check out our first glimpse of the show, all of these shots courtesy of The Stinger Report and Kevin Williams. This is part 1, and there will be a few more that I will get to over the next few days. I arrived at the show late today and didn’t have time to take any video or photos but Kevin has quite a few, a tiny bit of some highlights are below with much more to come. We first saw this one at a recent trade show in China, but only in pictures. I wasn’t sure what it was about until today however. 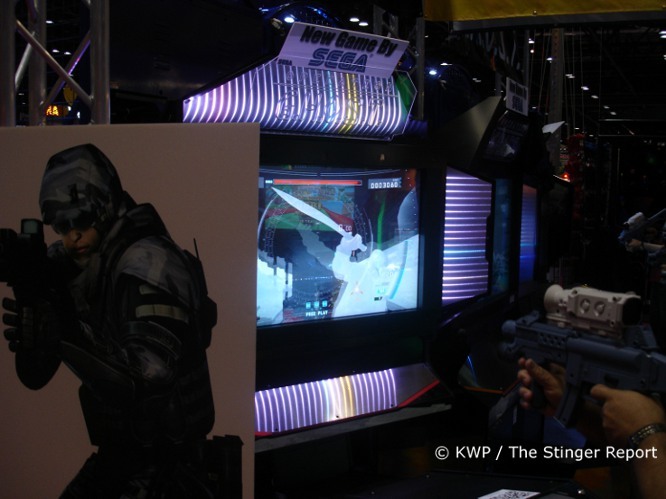 It’s a new prototype game by InJoy, prototype for the US that is as it’s available in Asia. It’s called Love Touch and it’s a touchscreen rhythm/music game. First you pick your idol/girl and you can dress her up. Then it gets into the music mode, where bubbles will float towards the center circle on the screen and you have to touch them when they reach that point. Some notes have to be drug along the circle as well. The game has card support although that could change for the US, where it also may have a ticket redemption option. It also has 30 songs, potential up to 50 with some updates. More on this one later. 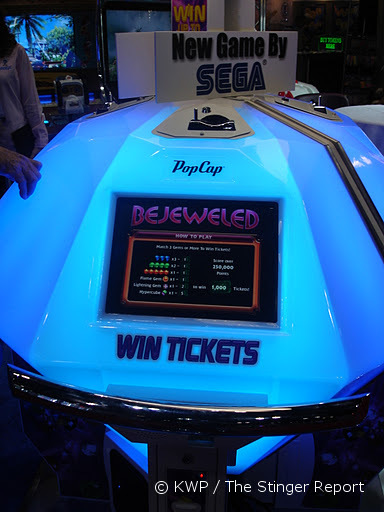 There was one game we heard a rumor about, Bejeweled by Sega. I wasn’t sure if this was going to be something like Giant Tetris or something else. Turns out it is something else, as it’s a videmption game (aka ticket redemption video game). The jewel cabinet is pretty cool, being split into two cabinets that together appear to be a whole jewel making four screens to play on. It uses small touch screens and when a player wins the coloring on that side changes gold. 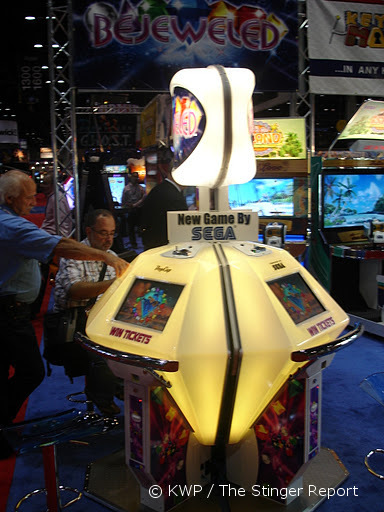 The jewel itself uses a translucent material much like what Sega did wth Sonic & Sega All-Stars Racing Arcade. Operation GHOST which we have discussed. It was interesting to finally see it in person, the LED effect is pretty cool. They actually had two of these running in Russian. Sega also had Virtua Tennis 4 and Let’s Go Island 3D for new stuff there, I will post more about these tomorrow. 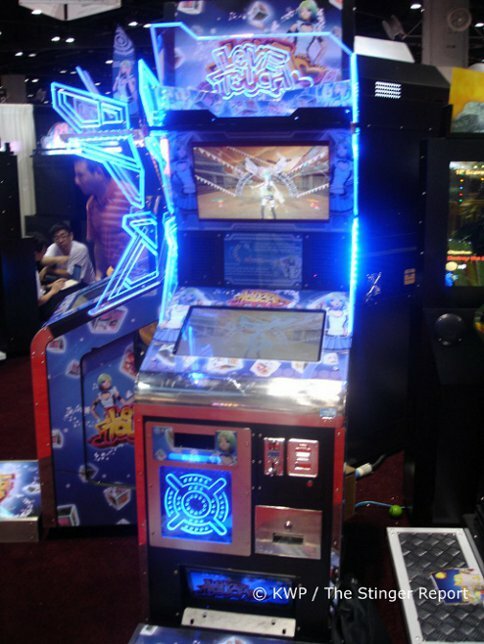 Namco’s big game, literally was Deadstorm Pirates 3D. There was a line when I came across it so I didn’t check it out yet. What I did see when I was there but I didn’t have a camera handy was Billy Mitchell at the booth to play some Pac-Man Battle Royale. Due to bad internet connectivity at the moment and it not uploading many pictures, and t being severely late I will get to much more tomorrow, hopefully this will tide you over for now.